Hey lovely bunch. I'm now into my second year of being completely gluten free after a lovely nutritionist told me she hardly ever sees someone as intolerant to gluten as me... Fun bit of news that was. 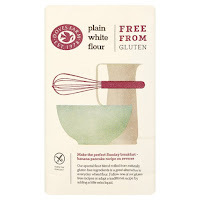 However, this led me on quite an exciting venture as I can now proudly call myself quite an expert on the Gluten Free Product Market as I have flippin' tested everything out there. 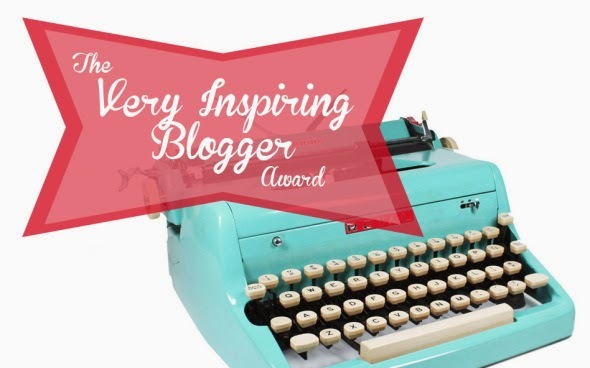 I'm gonna rock you through some fave finds of mine as well as introduce you to an awesome person who has helped me massively in my discovery of some amazing gluten free replacements that leave me without cravings for anything I used to be able to nosh. I'm going to go ahead and start with the biggy... BREAD. Firstly though, Schar is THE best gluten free, easily accessible, high street brand out there. Their bread is soft and doesn't fall apart like so many others do. This pack is normally retailed at £2.50 and the slices are quite small so I would go through this pack in about a week or two. It's made with a blend of gorgeous grains including Quinoa and it made using a Sourdough method. This makes it taste SO dang good. For my fellow lactose free peeps, this one is a totally safe option for you guys too. 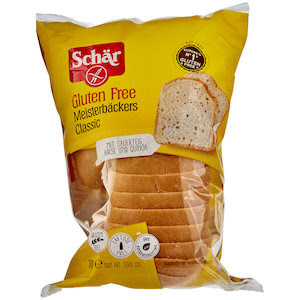 Schar has already been voted best Gluten Free Brand but now they have my vote too. Another GOD SEND by Schar is their gorgeous Margherita Pizza which is ALSO lactose free. Finding this in Sainsbury's by my flat was... on a scale of 1-10... freaking 100. Pizza is life. Being gluten and lactose intolerant means pizza is also death. BUT THIS PIZZA IS LIFE. Sorry... the excitement is real. I've been back and bought this a scary amount of times but for just £3 and 8 mins in the oven... you got yourself a delight right there my friends. You can grab this in most big Sainsbury's and some Waitrose chains too. Next we have the beloved British classic Crumpet... Warburtons' GF Crumps are the one. I've tried a couple of other brands but they are quite stodgy and don't seem to crisp up well. BUT these little gems toast like a gluten filled Crump but keep a chewy middle. You can grab a pack of 4 for £2 in the below stores. Whack a bit of butter and peanut butter on and BOYYYY. This next one is a life saver for us bakers out there. However, I am torn between two of my favourite brands of flour as both deliver great results but one is just slightly more pricey but has some other benefits. Dove Farm is the cheaper, more widely available brand and an absolute cupboard staple. For around £1.80-£2 you can pick up a bag and get busy on rivalling Bake Off. I've made tonnes using their Self-Raising and Plain ranges inc. Apple Crumble, Sticky Toffee Pudding Cake, Vicky Sponge and loads more. 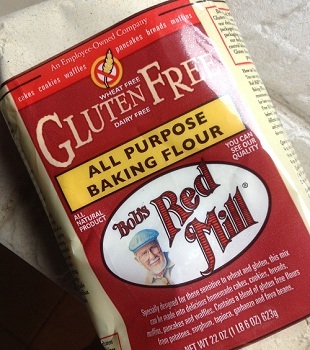 The good thing about Red Mill's blend is it is All Purpose so you can use it for any recipe and get a really well held-together bake. This flour gives a dextrous and dense finish just like normal wheat flours. It's fab but just a bit more expensive at roughly £4-£5 in most health shops. I'd be more likely to buy the Red Mill for pastry making as it holds together really well. I constantly prep my own lunches as it's pretty impossible to find a lactose & gluten free, healthy lunch on the go for less than a deposit on a house. Ok, exaggeration but it's bloomin' expensive. 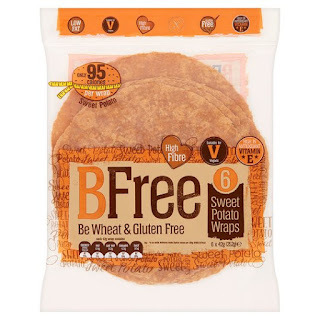 Hence why BFree's wrap range is gorgeous! Yes, they are a little costly as an average of £3.50 a pack however they come with 6 in a pack which is roughly 60p per wrap so I ain't complaining. These Sweet Potato wraps are SO filling, hold together amazingly well and taste so good. Stuff one of these with spinach, cucumber, red onion, goats cheese, avocado and some pine nuts and ooooooo yes. Now on to my FAVOURITE THING EVERRRR. Garlic Bread. Who doesn't like this eh..? EH!? 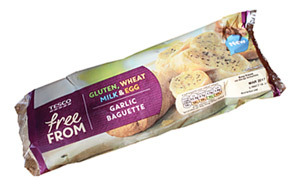 This amazing creation from Tesco is even VEGAN, people. This is a freezer jobbie and cooks from frozen in 12-15mins. I can't express enough how good this is. I would eat one whole baguette a day if I didn't care about my arteries or waistline. Annoyingly, I do care however I definitely have one of these in the freezer at all times. It's a must and at only £1.50 ermmmm... NO BRAINER. Eating out can be CRAZY hard as a gluten intolerant/ coeliac so learning how to cook some amazing alternatives at home will not only keep your tummy healthy but also your bank balance. Someone who helps me a lot is myglutenfreeguide on Instagram. Check her out here. This fab account goes is constantly trying out new products, travelling abroad and writing accounts of best places for us Gluten Intolerants. 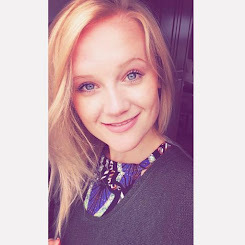 Big thanks to her for this amazing support page! Let me know in the comments below which Gluten Free Products are your favourite out there. I'm going to follow this post with a Gluten Free Sweet Buys very soon.